Whose Shoes? – Maternity. Passing the #MatExp baton … to Lewisham! Posted on December 1, 2014	by Gill Phillips - Whose Shoes? Our baby is growing! Since its conception back in June, the Whose Shoes? 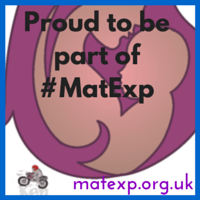 #MatExp project is finding its feet and even kicking a bit. In a good way, of course! We are also posting information about this project – and the type of improvements we are hoping to achieve, working in partnership with women and families, on our crowd-sourced #MatExp Pinterest board. I have so far told the story of how the project came about, leading up to our first workshop at Kingston Hospital – and published a Steller (visual) story. @WhoseShoes Hi Gill, The blog is wonderful, taking us through the whole creation experience! Our #MatExp team. Or at least some of us – as the whole approach involves constantly drawing in new people, listening to their ideas and working TOGETHER for positive change! We ran the second of the initial series of five pilot workshops at Lewisham Hospital on 21 November and were delighted that Diane Menage, a midwife from the Midlands with a special interest in compassion in maternity services, a.k.a @Dianethemidwife came down and wrote this great blog about her experience of it. @Dianethemidwife this could be great for student midwives ? Developing emotional intelligence #compassion. Diane had just come back from the ‘Compassion in Healthcare Conference’ in San Francisco. She had been telling everyone about Whose Shoes? and our project, including Roman Krznaric, a world leader on Empathy! @WhoseShoes Gill you ought to be one of the key speakers at next years conference! They would be bowled over! Our work was also showcased at the Royal College of Midwives conference. So how did we pass the baton from Kingston Hospital to Lewisham and Greenwich – and where do we go from here? Key factors were the firm foundations and attention to detail established in Kingston. The NHS England team had produced a ‘Hospital pack’ outlining the essentials of running a successful workshop (which, unofficially at least, now includes a cakes #Bakeoff!). Florence Wilcock then used the experience and feedback from the first pilot to initiate some great leadership notes to ‘bring the sessions alive’. This is such a key part of how Whose Shoes? works – creating energy and local ownership as well as a ‘process’. @WhoseShoes @MHTF @helenyoungMW @FWmaternitykhft @KathEvans2 @vicrayner Why not! Let us know when/where. @WhoseShoes @sitrapolicy @MHTF @helenyoungMW @FWmaternitykhft @KathEvans2 @vicrayner I will send you the details! @FWmaternitykhft @wildrubiescoach @WhoseShoes @DunsdonSarah @KathEvans2 positive #MatExp what it's all about! This one's a homebirth. Florence was busy until the last moment drumming up support before finally handing the baton to the Lewisham team. It is very important to involve Dads, including young Dads! @SeanyOkane @insideMANmag really interesting article any chance you are free fri 21/11 to join #MatExp workshop @LG_NHS @WhoseShoes ? @WhoseShoes can you send @SeanyOkane a link to #MatExp blog & story book so he can see what we are up to please! @WhoseShoes @SeanyOkane thanks Gill too hi tech for me to manage 😳 💻! @WhoseShoes @FWmaternitykhft @KathEvans2 @HelenKnower @lausinclair Let me do my utmost to join you on Friday! Thanks for reaching out. @KathEvans2 @DunsdonSarah @FWmaternitykhft @WhoseShoes @HelenKnower @lausinclair – Looks like I'm booked in for this Fridays event! Excited! There was also plenty of social media hype with regular countdown style updates, meaning that the Lewisham event was oversubscribed! @WhoseShoes @DrCJohn @WENDYMATTHEWS8 @HelenKnower @DunsdonSarah @KathEvans2 @LG_NHS @JackieMoulla @e_midwife only one day to go….! And very pleasing indeed to see that fab Helen Knower – who was leading the Lewisham workshop and had totally refused to join Twitter… joined Twitter and got a lovely reception. Well done, Helen! @WhoseShoes @HelenKnower @JackieMoulla @e_midwife @FWmaternitykhft @KathEvans2 Welcome Helen to the wonderful world of twitterville. @WhoseShoes @MHTF @helenyoungMW @KathEvans2 @vicrayner @sitrapolicy definitely #MatExp project 🌱becoming 🌳🌲🌳🌴🌾🌵🌻🌴 ! @DrCJohn @FWmaternitykhft Yes! And more ppl to include!! @New_Possibiliti @lausinclair @UHCW_Midwife @midwife_jane @SagefemmeSB @JennytheM..
Dear @EvelynWilcock Your daughter @FWmaternitykhft is bit of a 🌟 She's setting 🔥London 🔥on fire 👀💥🔥 In good way! #MatExp @KathEvans2 agrees. And a film or two! @helenbevan @andrewkfoster TY @ClevelandClinic for another powerful film. Look @FWmaternitykhft @KathEvans2. More ideas 4 #MatExp / #CYPExp. @FWmaternitykhft @NHSEnglandLDN @KathEvans2 @DrCJohn Best #whoseshoes scenarios provide powerful #MatExp thoughts 💭💭 💭. 💜 @ClevelandClinic! The Lewisham workshop deserves its own blog as there were so many fab tweets, photos and ideas generated, captured through Anna Geyer’s wonderful graphic recording. Suffice to say that the session went really well. It felt very action-focused, fuelled by the way Florence has been following up the conversations and pledges from the Kingston workshop so that everyone is very clear that this project is about real change and not just interesting discussions. There is loads of really great work going on already; this project aims to make it even better – and a lot more consistent! We are proud to be building a change management platform! We have a great team of passionate people and it is brilliant to see them getting some recognition for their dedication and commitment to improving maternity experience. The next workshop is on 16th December, closely followed by our #MatExp webinar on 17th December. Join us – we are looking forward to sharing the learning and outcomes so far! Please post comments about any topics that you think we should be including or tell us how you would like to be involved. It seems that everyone has a birth story! This entry was posted in Blogs, co-production, community engagement, health, housing, maternity, mental health, personalisation, well-being and tagged choice, choice and control, Compassion, empathy, health, make a difference, maternity, outcomes, person-centred, personalisation, Quality of life, Whose Shoes?. Bookmark the permalink. 3 Responses to Whose Shoes? – Maternity. 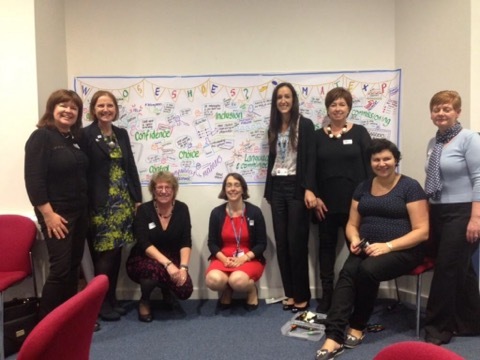 Passing the #MatExp baton … to Lewisham!